ASA001-623 – 635 interesting petroglyphs, intaglios (ASA001-626), and walls of petroglyphs, including large sheep and concentric circles. ASA001-629 was published as Plate 29 in A prehistory of Black Canyon (Howe, 1980). 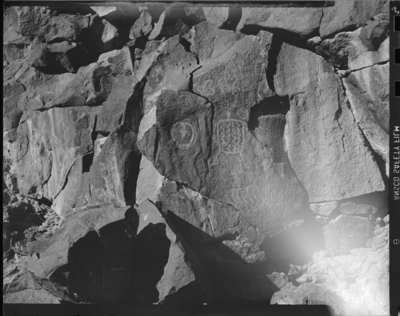 The plate caption reads “weathered petroglyphs – may be oldest recorded in Inscription Canyon.” ASA001-628 is a clear photograph of the same petroglyphs.